I was raised to eat meat. I was taught that as humans I was born with the instinct to survive, and my superior intelligence entitles me to hunt and eat inferior animals. And when I say “I” or “me”, I actually mean all humans and you. This will all change when I first saw the movie “Faces of Death” when I was 13 years old. 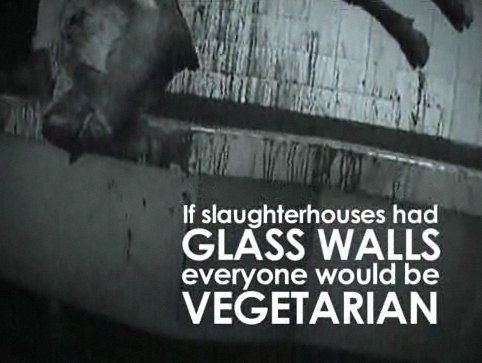 A particular series tell the story of slaughterhouses. I did not want to see it, but it was shown at a youth center I went to after school, surprised that they would show this to young teens anyhow. I tried to forget I saw this series, because the horrors of it still lives with me to this day. I understand that it is extremely hard to not eat meat, and a lot of people I know start off small – by cutting out beef, then pork, then chicken and so on. Most people love a good burger, and so do I. Most people will try to ignore the fact that our meat comes from horrible cruelty, and eat it with a distant guilty conscience, like I do. When I saw a video 10 years ago of how baby pigs were killed, I stopped eating ribs and bacon for 2 years. I believe I can do this again very easily. And I will. 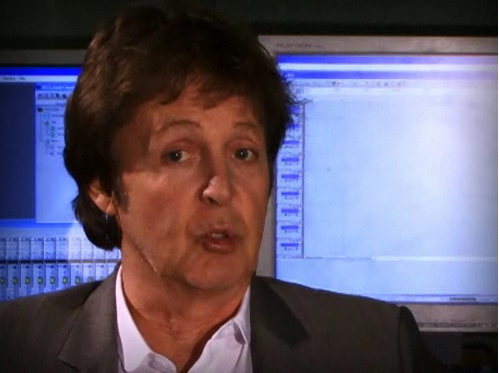 Then today, I came across this website, no doubt it’s probably from PETA, a video featuring Paul McCartney. I immediately regurgitated my dinner, and instantly regretted at pressing the “play” button. But the reality is, that it reinforced my decision to become vegetarian. I sympathize with those who loves to eat meat, but I just want to ask you to take a moment, and think about not only the harm that it does to your body (at least the non-organic meats), but how cruel the industry really is. If you are interested, see this video here. I warn that it is not easy. I took screenshots of so screens here. 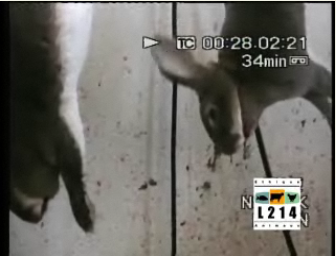 The first one is a cow hung by its feet, throat slit and bled out. Its head is almost falling off, but he’s still alive, and twitching. A little piglet is getting stomped on and electrocuted. Can you imagine the pain and suffering billions of livestock go through for your taste buds? I haven’t blogged for a while, mainly because of my busy professional schedule, and to be honest, to let the steam cool off from my China Cat Massacre post that is getting a lot of debate, both positive and negative. Fashion Week is one of the biggest event in NEW YORK CITY, and say what you will about PETA, though I’m not a big fan of their tactics, someone has to stand up against FUR. Like the years before 2010, PETA is holding a public protest, this year themed “Animal Prints. Not Animal Skin.” Though I don’t think spilling red paint on people’s fur coats just to make the point is cool by any means, I do think that showing up to show support for anti-fur can help make a strong statement. Over the years, I’ve noticed a lot of brand name designers like Stella McCartney and other retail chains like Payless shunning the use of fur in their lines, and it’s a growing trend – many of my friends stopped buying fur trimmed coats and are more conscientious about shopping. But in the September issue of VOGUE for which I eagerly awaited (mostly for their insightful articles – truly), I was disgusted with the amount of fur ads and trend reports within. Even designers like Donna Karan had some fur pieces. Looks like I’m going to have to add more labels to my boycott list. You think I am happy about that? NO. I love fashion, particularly the new Gucci and Fendi handbags – but I’m making a choice not to be a patron until they stop perpetuating the cycle of cruelty. When: Tuesday, September 14, 11:45 a.m.
RSVP by e-mailing my colleague Ashley at AshleyB@peta.org or 757-274-9675. When it comes to anti-fur topics, we often focus on fox, seals, horses, minks and many helpless exotic animals, even tigers. We must not forget about rabbits. Each year in China and France, millions of rabbits are slaughtered for fur. In these horrible conditions, rabbits are often inproperly electrically stunned and hung by their legs , while their throats are slit and bleeding out, they are often still alive, twitching, suffering in the most disheartening ways. The following video is an undercover video, narrated by Gillian Andersen of the X-files. 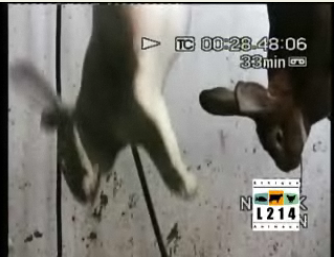 It exposes the unspeakable cruelty and horror of rabbit slaughter farms in China and France. Whether you’re a fan of PETA or not, this truth is out there. This targets particular Giorgio Armani, one of the largest patron of using rabbit fur for their fashion line. Please take action by filling out this guided letter template to be sent to the fashion house. Please spread the word to your friends, and please read the label on your winter jackets. My friend Evan sent me this link. Oprah did a special segment on a saint, Susan Marino, and her facility called Angel’s Gate Animal Hospice. The place is the first-ever care center and permanent home for hundreds of handicapped, sick, and dying animals, giving them much-needed love, medical care and a last chance to live happily ever after. 90% of the dogs and cats here came from puppy mills, where the animals suffered from living in unspeakable conditions and abuse. 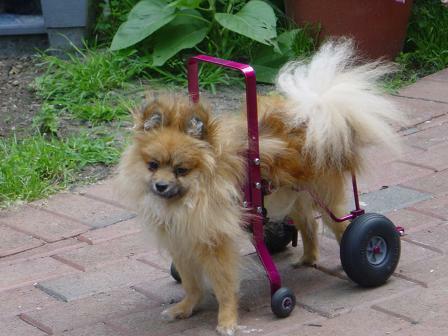 Nancy would bring in the worst case scenarios in effort to give them a home for life. It’s really a touching story—click on this link here and scroll down to watch the short movie. Make a donation at Angel’s Gate site or share this wonderful stories with your friends! 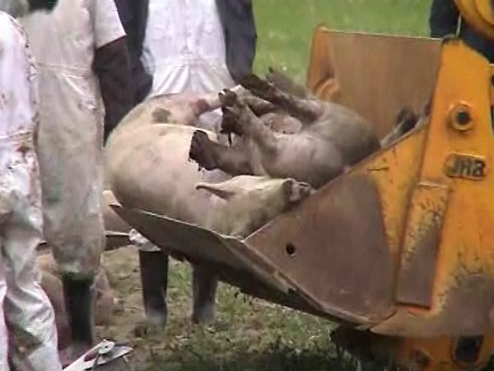 Farm animals endure extreme cruelty, especially in America. As they are bred for consumption, factory farm industry workers often do not view them as living, breathing, feeling animals, and therefore treat them as objects that could be tortured, controlled, and killed without anesthesia. Cows live in stagnate positions in farms in their own filth for months and years. Their journeys to the slaughterhouse is atrocious, in assembly, with their throats cut, electrocuted, their heads bashed in order to stunned them. 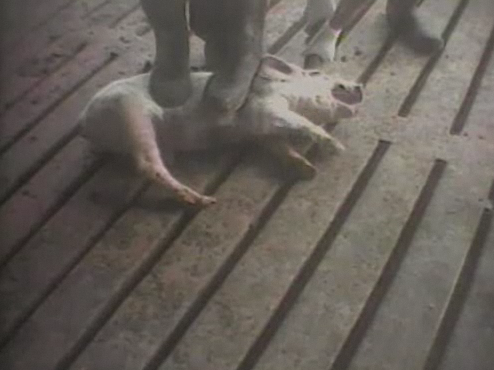 Often they die painfully and slowly while being butchered. Pigs live their entire lives in crates so small they cannot move and develop sores. Piglets are pulled from their mothers so early—they are castrated, branded without drugs, and also killed unmercifully. Among these are many other like veal, chickens, lambs (for wool) that suffer needlessly. It’s bad enough we eat them, the least we could do is show a little decency. We are what we eat. The more suffering an animal endures, the higher the chance it is sick and bad for consumption. Think about it. If you must eat meat, avoid veal and go organic where animals receive kinder treatments, free of radicals and antibiotics, and have had better lives in roaming free. For more information: visit PETA or Farm Santuary. When I was a little kid, my summer camp instructor took us to the circus. I was overjoyed at seeing all the acrobats do all these amazing stunts. The show was full of animals and they performed gloriously at the snap of a finger, and I thought how wonderful it all was. I thought they were so obedient and had wondered if I could get my pets to do tricks too. Now that I’ve grown up I have come to the horrific conclusion that not only is animal performance unnatural, it is extremely cruel. Elephants are captured in the wild either from Africa, Thailand or India, usually as infants kidnapped from their herd, and shipped back to our country to endure long, painful lives in chains. They are often beaten with bull hooks and starved when they don’t obey their handlers. Along with them, other animals such as bears, tigers, monkeys are forced to travel long hours, wear uncomfortable costumes, eat poor diets and abused in some way in order to perform tricks over and over again. Have you ever heard in the news where elephants or tigers that suddenly went crazy on their masters, even killing some of them, in order to escape? They are disheartened, sick, and hopeless creatures, living in fear each day for the rest of their lives. Kindly consider this the next time you want to bring your kid to the circus. Do you want you child to learn that it is okay to treat animals in such a way for the sake of entertainment? Go see Cirque De Soleil, a people-only circus, among many nowadays which are all amazing. Boycott Ringling and Barneys- they are closely watched by PETA and many animal welfare organizations. Visit Performing Animals Welfare Society and learn more about the subject or make a donation!